NEW YORK -- The Greater New York Chapter once again pulled together to show its Crimson Tide pride with approximately 60 people outside of the Best Buy Theater in support of Trent Richardson prior to the announcement of the 2011 Heisman Memorial Trophy. Despite the cold, Alabama fans gathered in full force to cheer on Richardson as he walked to the theater with the other finalists. Richardson spent a few minutes with the Tide fans, signing autographs and taking pictures just prior to entering the theater for the presentation. Joining chapter members for the rally were about 12 football players and their coach J.D. Vick from Nutley High School in New Jersey. Vick, a Tuscaloosa native, took 15 players to Tuscaloosa to help with clean up after the tornado and the players fell in love with the University. The Nutley players wore Alabama caps and Houndstooth hats and were definitely the loudest and most boisterous of the Alabama supporters in the Minskoff Theater Alley. Michael Casagrande wrote an article in the Decatur Daily about Vick and the Nutley players. After the Times Square rally, 26 Alabama fans trekked over to The Hill to watch the ceremony. 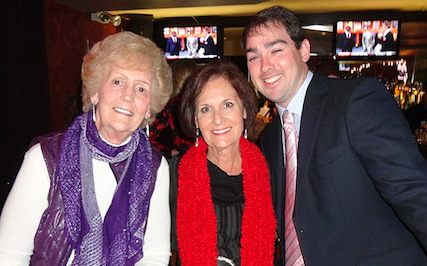 Among those at The Hill were a three-generations (grandmother, mother and son) family of Alabama alums from Birmingham who were visiting New York City for the weekend. Two days after the rally and watch party, former Alabama and New York Jets defensive tackle Marty Lyons was presented as the sixth recipient of the Heisman Humanitarian Award at the 77th Annual Heisman Memorial Trophy Dinner at the New York Marriott Marquis.